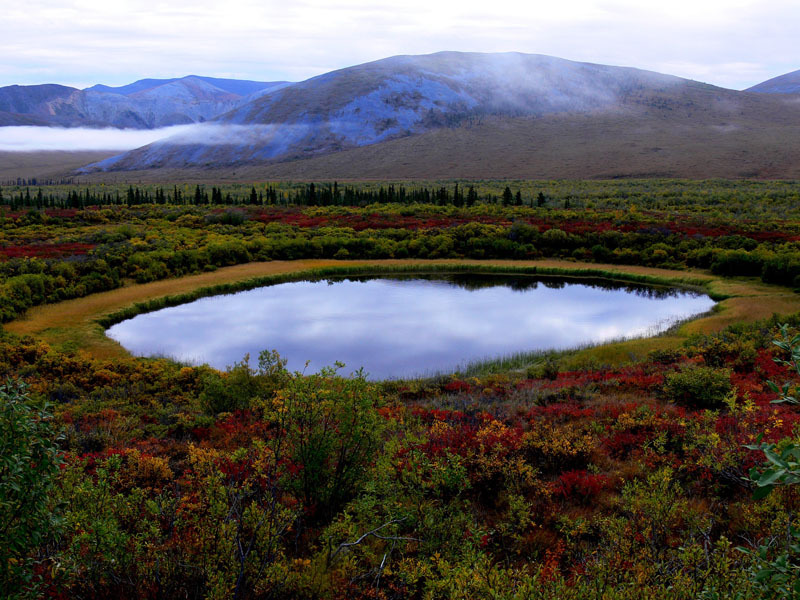 The tundra is the world’s youngest biome, having formed about 10,000 years ago at the end of the last ice age. Humans have been living in Canada’s tundra for the past 5,000 years. The Arctic tundra contains the largest amount of fresh water available for biodiversity than any other biome. There are three types of tundra worldwide—the Arctic tundra, the Antarctic tundra and the Alpine tundra—which share similar conditions. The Arctic tundra is the biome that lies between the edge of the taiga (or boreal forest), or tree line, and the permanent ice caps closer to the North Pole or the Arctic Ocean. 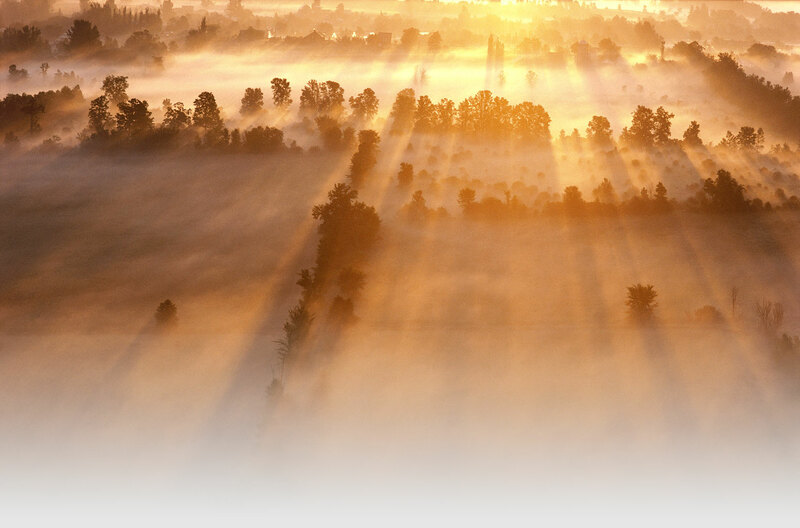 It is composed of a variety of landscapes, from sweeping lowlands to towering mountains. Often thought of as a barren and somewhat rocky biome, the tundra surrounds the pole and is the dominant biome in the Arctic and Subarctic regions. 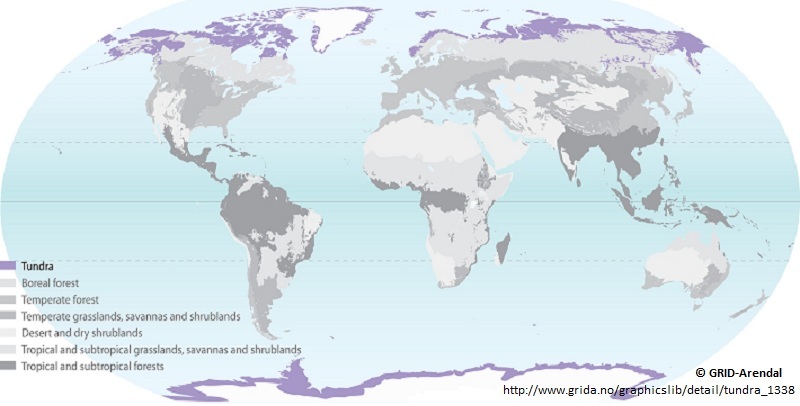 Map of biomes of the world with Arctic, Antarctic and Alpine tundra in purple. The Arctic tundra is at the northern extremity of North America, Europe and Asia. In Canada, the Arctic tundra can be found in Yukon, the Northwest Territories, Nunavut, northeastern Manitoba, northern Ontario, northern Quebec and northern Labrador. Worldwide, it is found in Alaska, Greenland, Russia, Iceland and parts of Scandinavia. 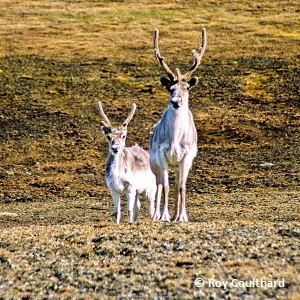 Physical characteristics of the tundra are low temperatures (the winter average temperature is -34°C, the summer average is between 3°C and 12°C), low precipitation levels (between 15 to 25 centimetres including melting snow, which is drier than most deserts), high winds and no sunlight for as many as 163 days per year in its northern areas. These conditions create a harsh climate. The growing season is short, with only 50 to 60 days per year when temperatures are high enough for plants to grow. Biodiversity is also low, compared to most other biomes, as not many species are able to adapt to survive in the tundra. Since the temperatures are so low, soil is very slow to form. There is a thin, 25 to 100 centimetre melt layer in summer, called the active layer, which is soil that goes through a freeze-and-thaw cycle annually. Below this layer is the permafrost, which stays permanently frozen. Winters on the tundra are long, dark and cold. Snowfall is low and most of the ground becomes covered with packed, dense and hard snow. In some areas, high winds can cause thick snowdrifts that become hard packed. During the summer, the snow and the soil layers above the permafrost (the active layer) melt. This creates and feeds a vast network of lakes, streams, rivers and wetlands. The waterlogged soil and 24-hour sunshine boost rapid plant growth, and in lower latitudes of tundra even lush, densely packed plant mats can grow. This forms a beautiful landscape and provides food for wildlife that either lives in the Arctic year around or migrates there to take advantage of the rich burst of food that is suddenly available in summer. 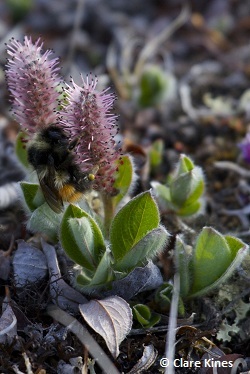 Nearly 2,000 species of plants, mainly mosses, sedges, grasses and flowering plants, form the vegetation of the tundra. 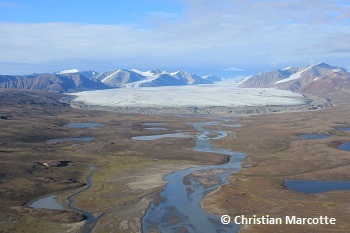 The diversity of species decreases gradually from the tree line to the permanent ice caps farther north. 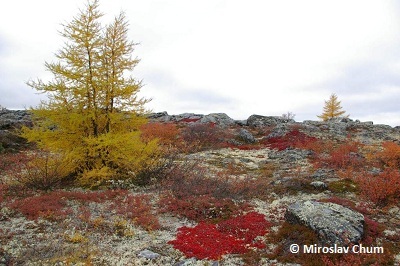 Because of the climate, permafrost and short summers, tree species such as birch and willow are ground cover—they grow horizontally, not upwards, in this biome. This also helps plants benefit from the insulating snow cover during the winter. Tundra plants need to grow fast during the limited amount of time that temperatures and sunlight permit. This makes the short-lived summer months very colourful; many stunning flowering plants, like the Dwarf Fireweed and Mountain Avens, are in bloom at this time. 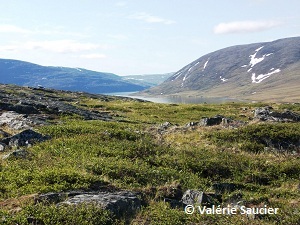 As the sun shines 24 hours per day during the summer above the Arctic Circle, some Arctic plants can grow and develop very quickly, compared with their southern counterparts, in this indirect light. 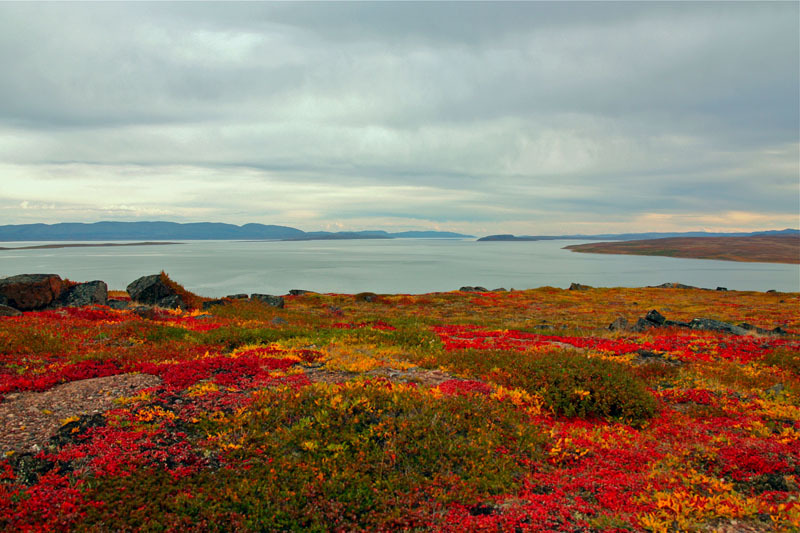 Plants living on the tundra have adapted to the short growing season, high winds, low temperatures, lack of humidity and low nutrient levels in the thin acidic soil. They have shallow root systems that can only grow in the active layer of soil, or the soil that is not frozen during the summer. Growing close to the ground to take shelter from the strong winds and take advantage of pockets of dark soil and rocks that absorb heat, tundra plants tend to stay short and grow flat on the soil, as is the case for the purple saxifrage, the Net-veined Willow and the other tundra shrubs. Another way for plants to stay warm is for different species to grow huddled together or for one individual species to grow in a specific pattern, such as a rosette or in thick mats, like the Moss Campion and Three Toothed Saxifrage. This traps warmer air between individual plants and helps growth. 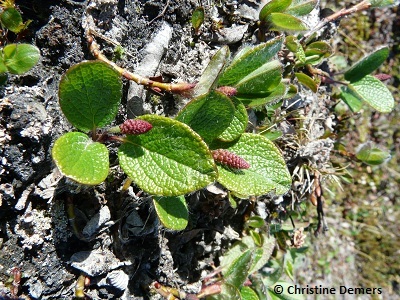 The shape of the flowers, leaves and stems can also be adapted for life in the Arctic. 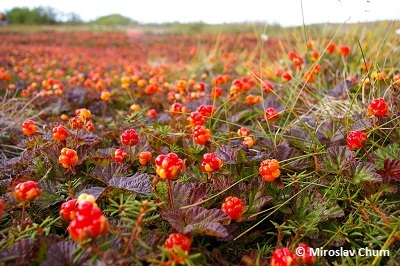 Some tundra plants, like the Mountain Cranberry, have desert plant–like adaptations, such as wooly hairs, thick leaves and a thick, waxy skin to prevent water loss from the leaves due to the drying winds. To prevent them from drying out, several plants have no stems at all! 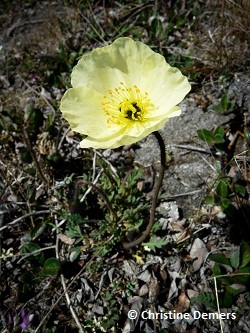 Some flowering plants, like the Arctic Poppy, have big flowers that can orient themselves to face the sun at all times. Their colour and shape also helps heat absorption. Others, like the Bog Rosemary, have downward facing flowers that act like little greenhouses. 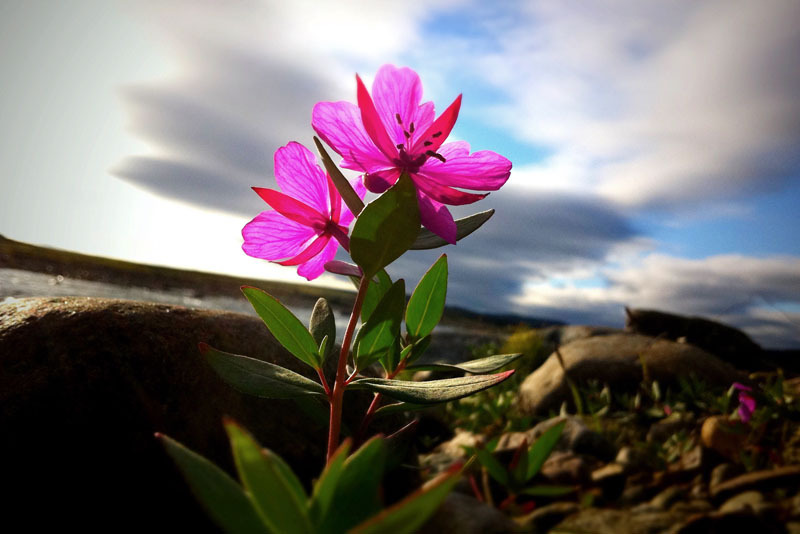 Warmer flowers or transparent seed pods mean that the seeds contained in them will mature more quickly, which is vital in the brief Arctic summers. Leaf colour is also important, which is why some species, like the Arctic blueberry, turn red at the end of the summer. This enables the plant to absorb a broader spectrum of light. Other species have evergreen leaves that start photosynthesis as soon as the soil thaws. Some can even grow while still under the snow, using nutrients stored in their roots! As seed production demands energy from plants, and seed survival is uncertain during the harsh winters, some species, like the Primrose, produce nutrient-storing tubers, buds or rhizomes that stay underground and are ready for growth in the spring. Other plants that produce seeds have structures to help their dispersal. 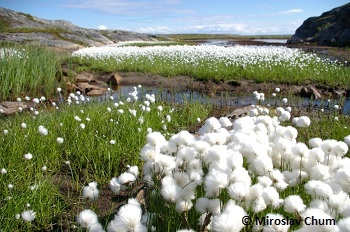 For example, Cottongrass is a sedge with tufts that help the seeds get carried by wind but also act as insulation. 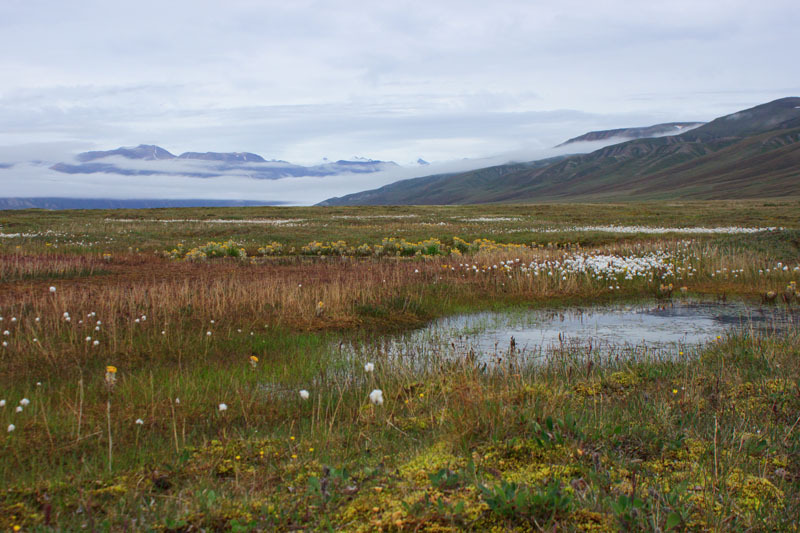 Because wetlands and lakes appear all over the landscape in summer, many tundra plant species have adapted to growing in very moist areas or even in water. Some, like the carnivorous bladderworts, can be submerged in water or float on top of it. 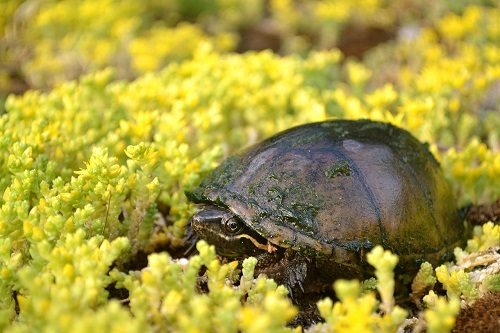 These plants are not only a food source for waterfowl, fish and invertebrates that inhabit these ecosystems, but they also provide shelter to some of these same species. Mosses are very common and diverse in the tundra. 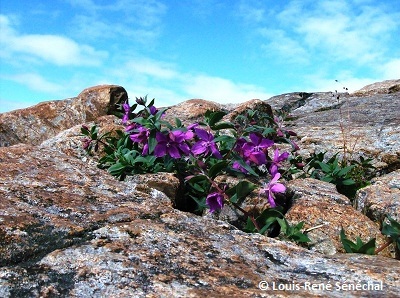 Some species can grow directly, in the form of a mat, on rocks or soil, being devoid of roots and stems. They play a great role in the tundra, since they actually insulate the permafrost! These primitive plants also do not reproduce by seeds but rather produce spores, which use water and wind as a means of dispersal. Thus, mosses need high moisture to both reproduce and grow (they absorb water directly through their small, delicate leaves), but in the dry Arctic, they survive through droughts by going into dormancy. Peat moss is common throughout the tundra in bogs or other wetlands. Mosses come in a variety of colours, like orange-red moss. 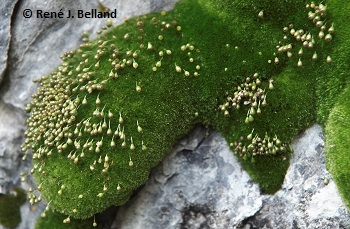 One of the tundra’s species at risk is Porsild’s Bryum, which is a type of moss. 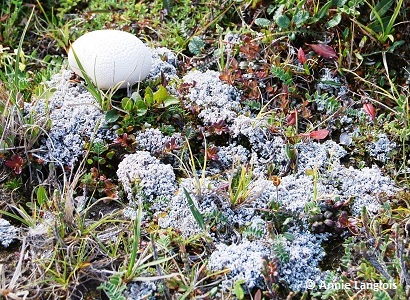 Hardy lichens play an important role as a food source for a variety of species, including barren-ground caribou, which eats mostly reindeer lichen, a group of lichen species, in the winter. Lichens are the result of a symbiotic relationship, similar to the one that forms corals. Fungi provide a structure and the absorption of minerals from the environment (the rock, soil or plant it grows on), while algae or bacteria can produce energy from light via photosynthesis to feed themselves and the fungi. The alga or bacterium lives embedded within the fungus, and this association of different species makes for a great variety of lichens of different colours and shapes. Lichens, like mosses, need moisture to grow and can go into dormancy if conditions are too dry. 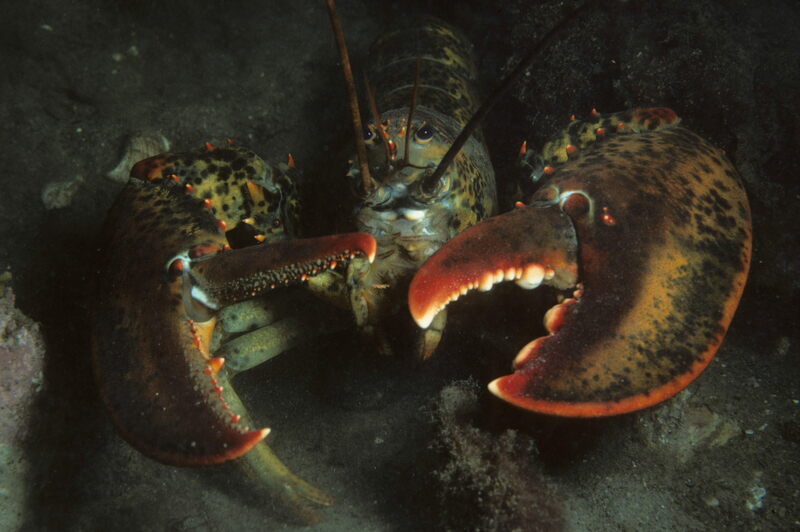 Their growth is very slow, but they can live for extended periods of time (as much as 4,000 to 5,000 years!) if left undisturbed. Lichens are very sensitive to air pollution, and scientists use them as a bioindicator of air quality. The harsh climate and conditions in the tundra biome mean very few species are able to thrive there. Even so, several animals call the tundra home throughout the year, or for at least a few months of the year. Many wildlife species’ populations fluctuate up and down in cycles, as is the case for the lemming. While the reasons for these cycles are currently unknown, the cycles do help regulate the populations of predator species that depend on lemmings for food. A few fish species inhabit the freshwater rivers and lakes of the tundra. They provide a food source to the many birds of prey that spend their summers in the Arctic and to mammals that stay here all year long. Arctic Char is a relative of the salmon, which spends part of its life cycle in fresh water and other parts in salt water. 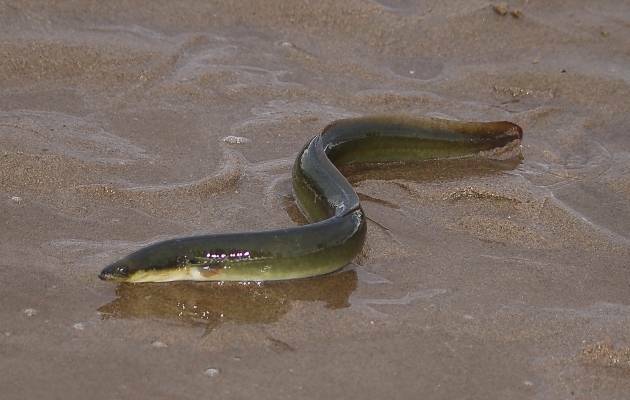 Some individuals have become exclusively freshwater fish after becoming land locked. Char is found everywhere in freshwater tundra, habitat and its distribution extends farthest north of all freshwater fishes in Canada. 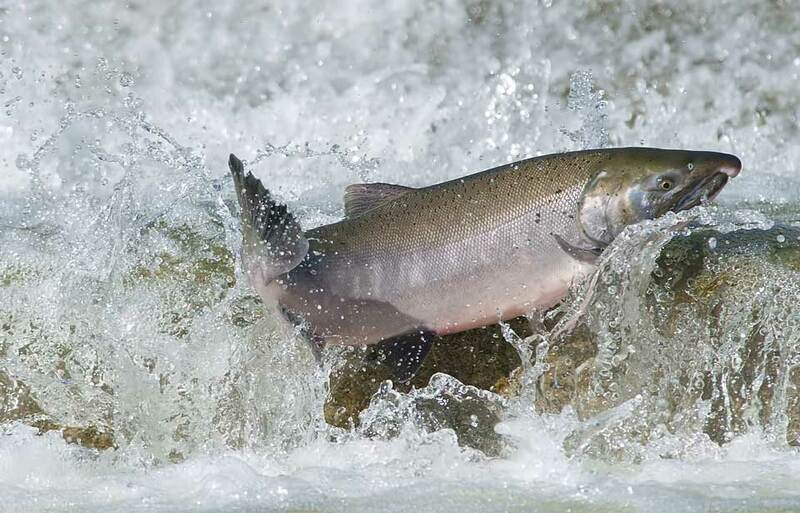 Other relatives of the salmon found in tundra waters include Arctic Grayling, Lake Whitefish and both lake and brook trout. 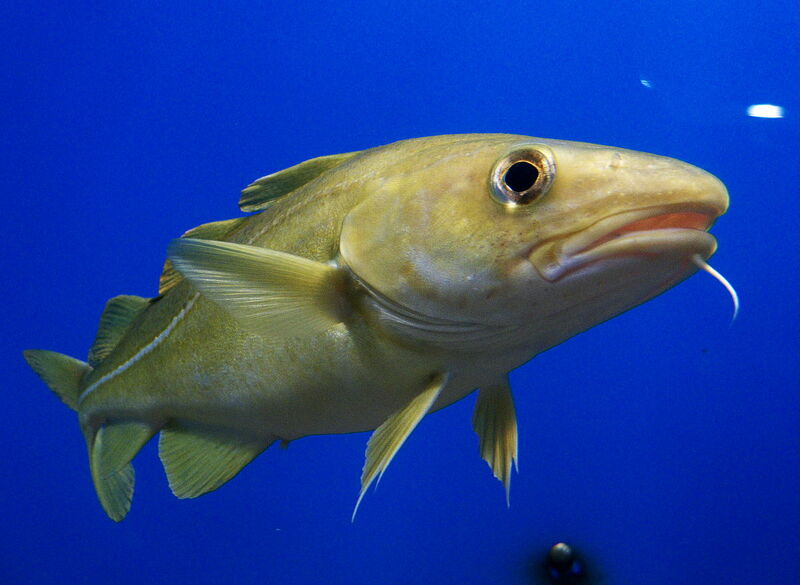 Fish in other families commonly found in the tundra are Arctic Cod, Ninespine Stickleback and Northern Pike. 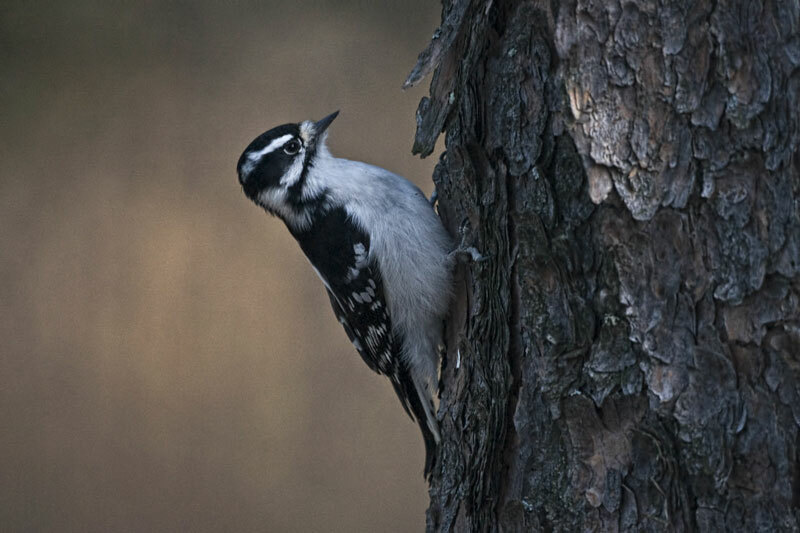 Birds form the most diverse group of vertebrates in the tundra. 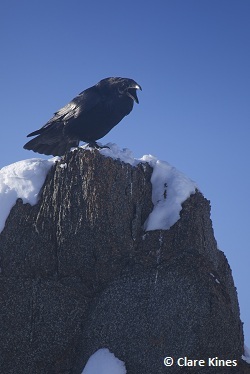 Only the Common Raven, Snowy Owl and Rock Ptarmigan remain in the biome over winter, having the adaptations needed to do so. All other birds migrate to the tundra to nest and rear their young, returning to southern climates in late summer and early fall. 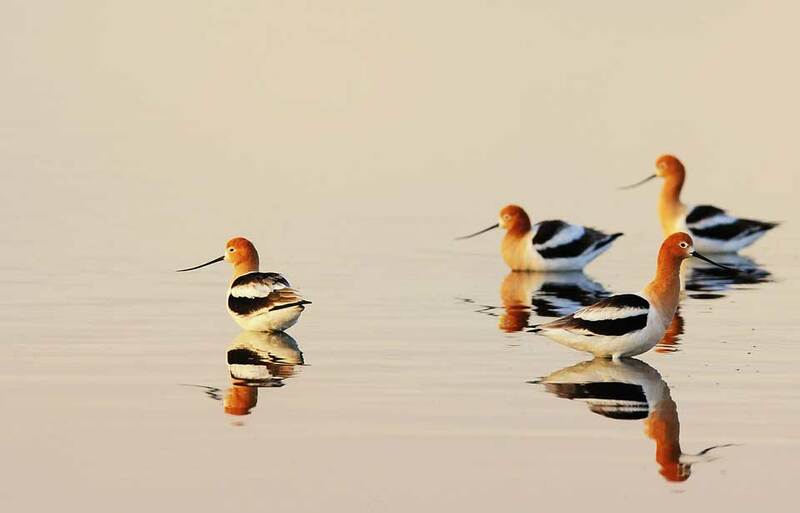 These birds include many waterfowl species, such as the Tundra Swan, the Long-tailed Duck, and many shorebirds, like the Semipalmated Sandpiper and the American Golden-plover, which inhabit the land near lakes, streams and rivers and in wetlands in the summer. 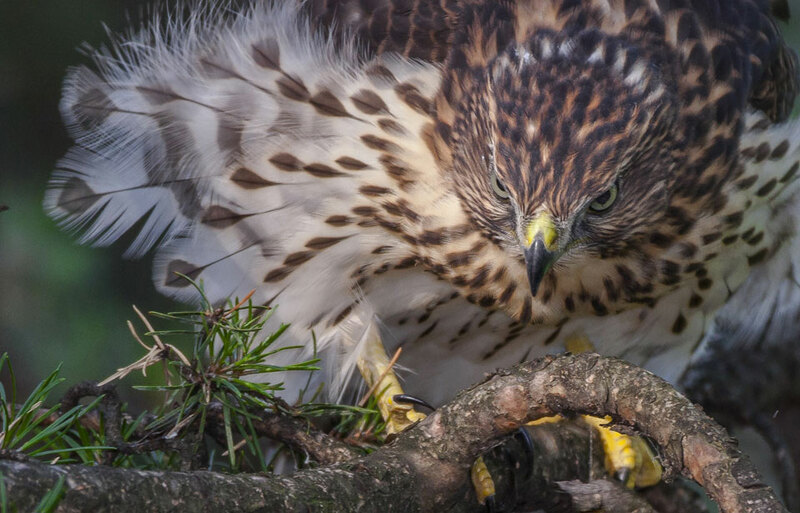 It also includes many birds of prey, such as the Gyrfalcon and the Rough-legged Hawk, which feed on the wide variety of prey species available. 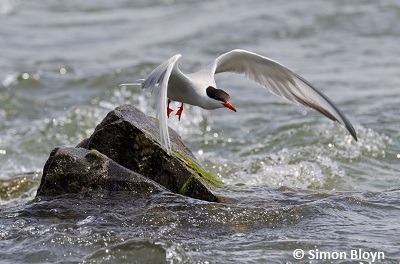 Gulls and jaegers also take advantage of the large amount of food (e.g., eggs, chicks, lemmings, voles) available during the summer breeding season. 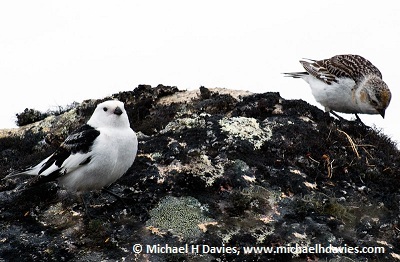 Songbirds such as the Snow Bunting, the Greenland Redpoll, the Lapland Longspur and the Common Redpoll are found throughout the tundra in all habitat types. 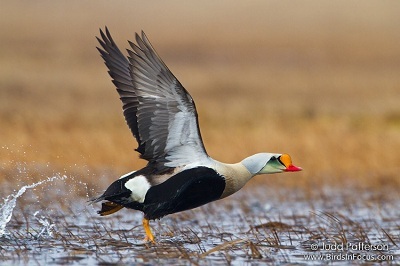 Sea ducks, like the Common Eider, and seabirds, like the Thick-billed Murre and the Arctic Tern, are two other important bird groups found on the tundra. 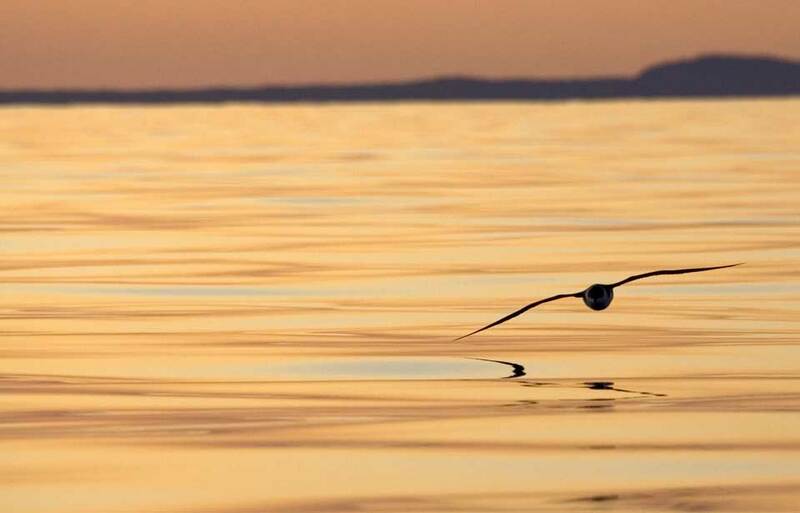 As the names ‘sea ducks’ and ‘sea birds’ suggest, they live primarily near the Arctic Ocean and rely on the marine environment for their food source. 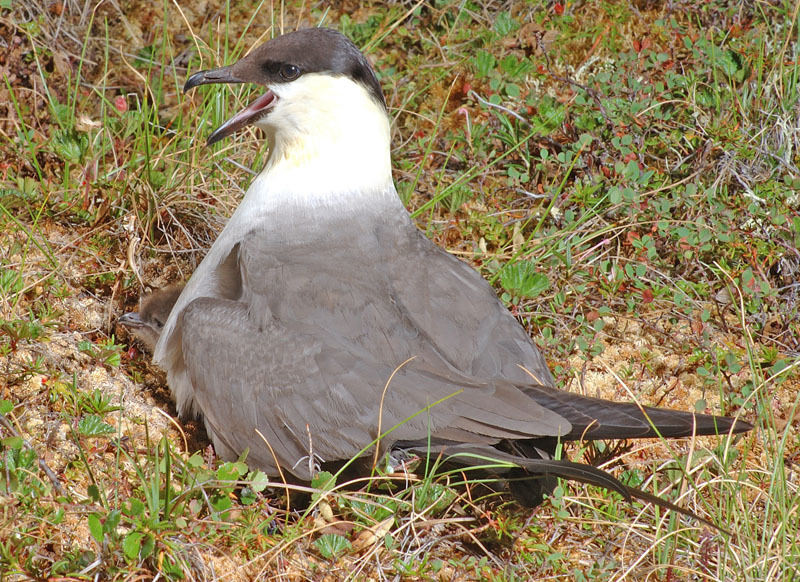 Thick-billed Murres, Northern Fulmars and Black-legged Kittiwakes nest on steep cliffs near the ocean and also spend their summers in the Canadian tundra. The Rock Ptarmigan, a grouse species, remains in the tundra throughout the year; its feathered feet keep it warm and help it walk over the snow. 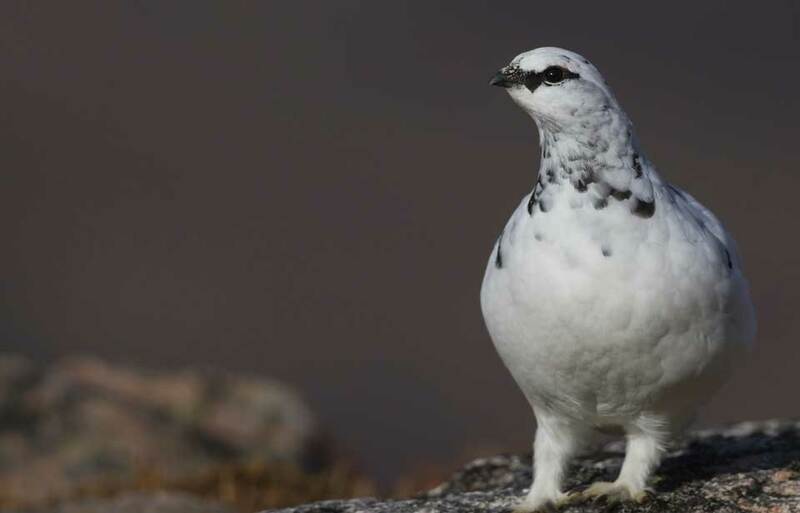 Like other ptarmigans, it has three seasonal plumages, including a white colouring in the winter to help it blend in with the snow and camouflage against predators. 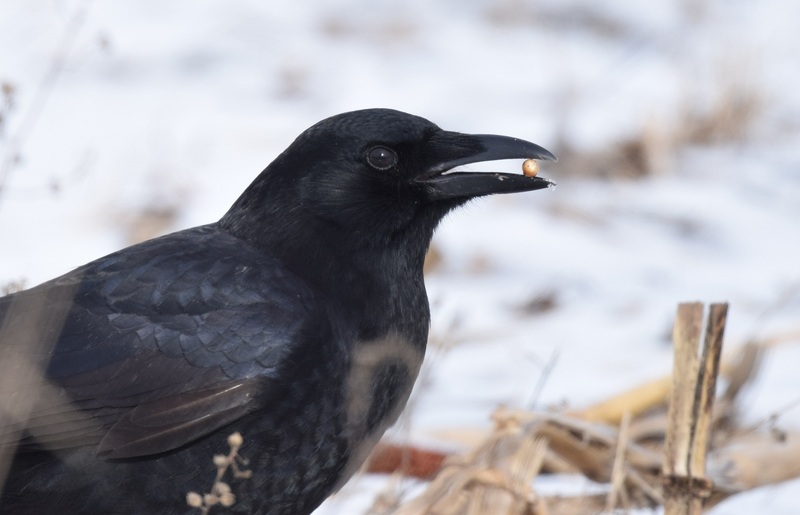 During the cold months it forages for vegetation by day, eating old berries and dried plant buds and dwarf birch under the snow, and roosts in snowbanks by night or during storms. 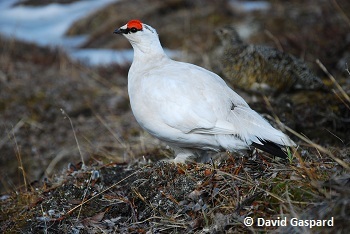 Some Rock Ptarmigans move closer to the tree line in the winter and instead roost in shrubs. In the summer, they feed on a variety of tundra plants, especially the many species of willow, saxifrage and heather. 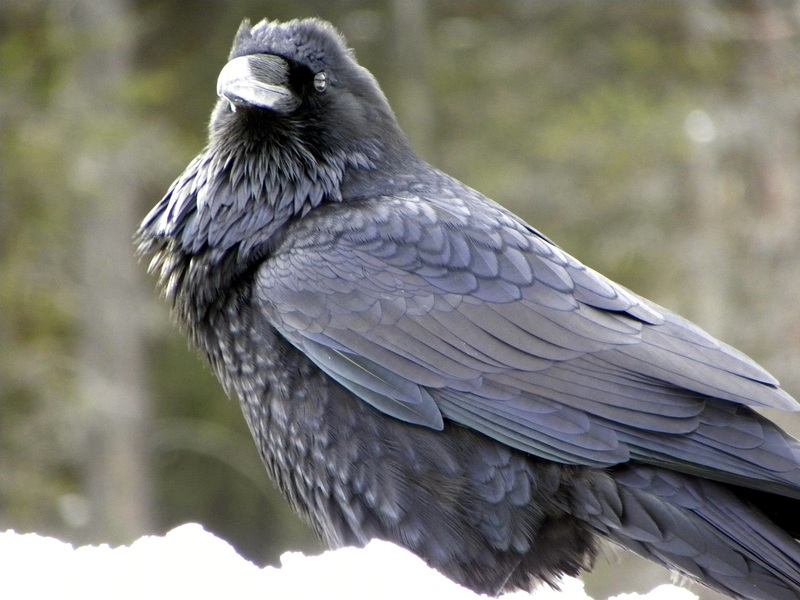 The Common Raven is found almost everywhere in Canada, including the tundra. 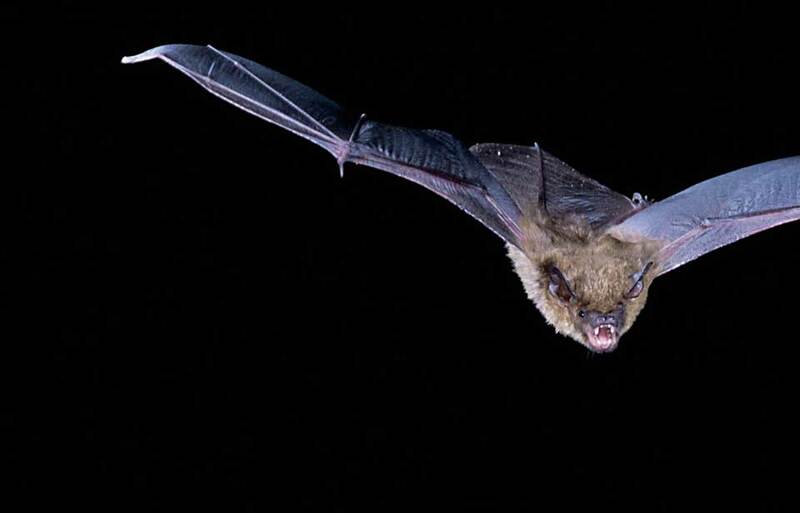 Being an omnivore, it eats a wide variety of foods, which it also hides in caches for the winter. This species is a scavenger—it is able to survive in the cold Arctic climate by feeding from carcasses left over by predators like the polar bear or Arctic Wolf, by raiding the winter caches of other animals like the Arctic Fox or by foraging on human garbage in dumps. 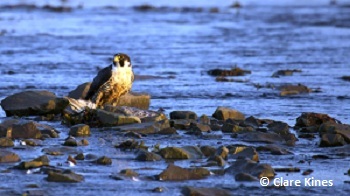 The tundrius subspecies of the Peregrine Falcon migrates to the tundra from as far as South America and spends the summer months nesting on tall cliffs in many areas of the Arctic. They feed on birds found on the tundra during the summer. 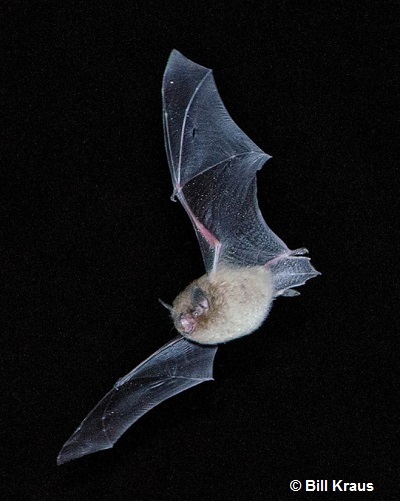 When doing stoops, or descents to catch prey, they can reach speeds of up to 300 kilometres per hour! Unfortunately, this bird is listed as a Species of Special Concern under the federal Species at Risk Act. 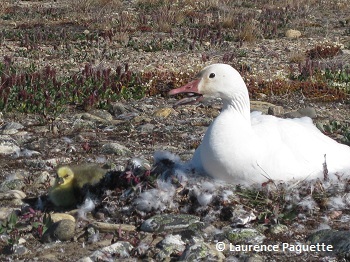 The Snow Goose lives on the tundra lowlands from early June to early September. It comes to nest so far north to be able to feed 24 hours a day on the roots and leaves of a large variety of grasses, sedges and other plants. This goose undertakes a very long migration to reach the Arctic, travelling in flocks for over 4,000 kilometres! 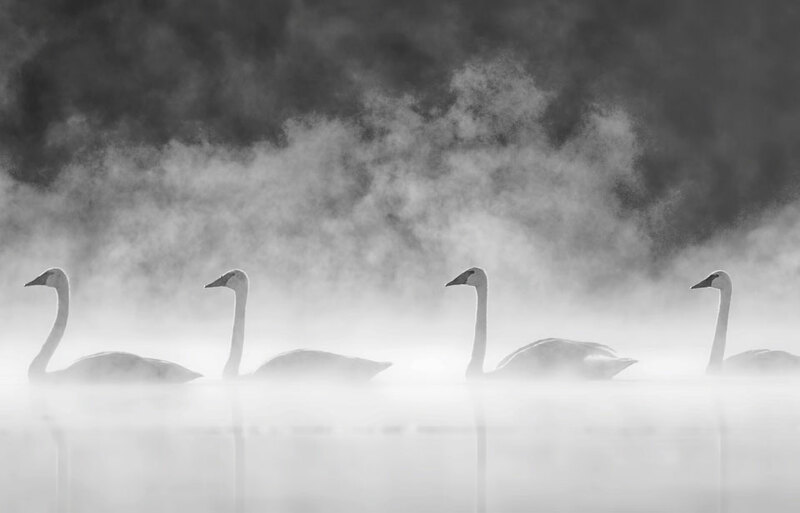 The Cackling Goose, the White-fronted Goose and the Canada Goose are some of the other goose species that flock to the tundra for breeding. 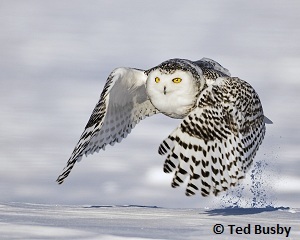 The Snowy Owl is one of the tundra’s most recognizable birds. This large owl is mainly a tundra breeder, migrating to southern Canada and the northern United States for the winter, but some individuals also overwinter in the southernmost areas of tundra as well. 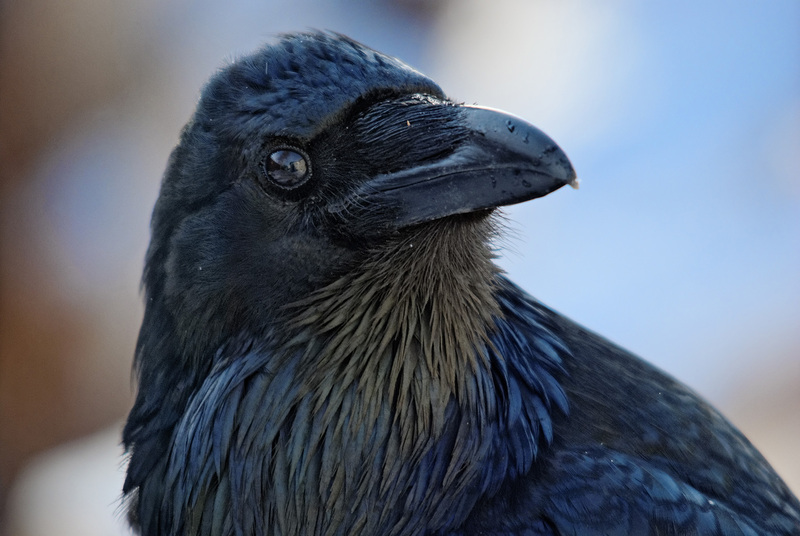 It is well adapted to the cold, with dense layers of down and feathers that extend onto the bill, toes and claws to provide insulation. Since lemmings are one of this bird’s main prey species, the snowy owl’s population fluctuates with lemming populations. When lemming populations are low, the Snowy Owl will feed on Arctic Hare and birds ranging from small songbirds to ptarmigans to medium-sized geese. 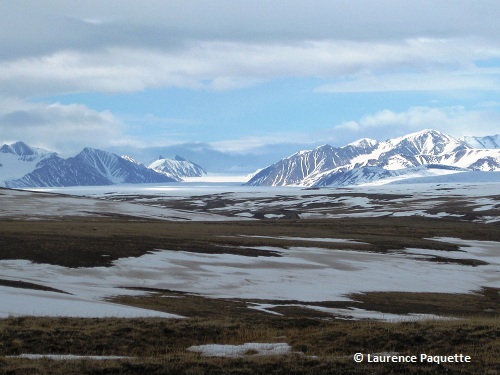 Mammal diversity is low on the tundra as the species that inhabit this cold landscape must be adapted to the long months of severely cold temperatures and snow cover. Only about 20 species of mammals call the tundra home. Hibernation is not an option for the vast majority of species in the Arctic, as very few can survive while remaining inactive throughout the long winter at such low temperatures (the Arctic ground squirrel is the only species able to hibernate in the biome). Tundra mammals require a multi-layer fur coat, a stocky body, broad and hairy feet or hooves that act as snowshoes, a thick fat layer and small or short appendages and extremities (legs, tails, ears, etc.). 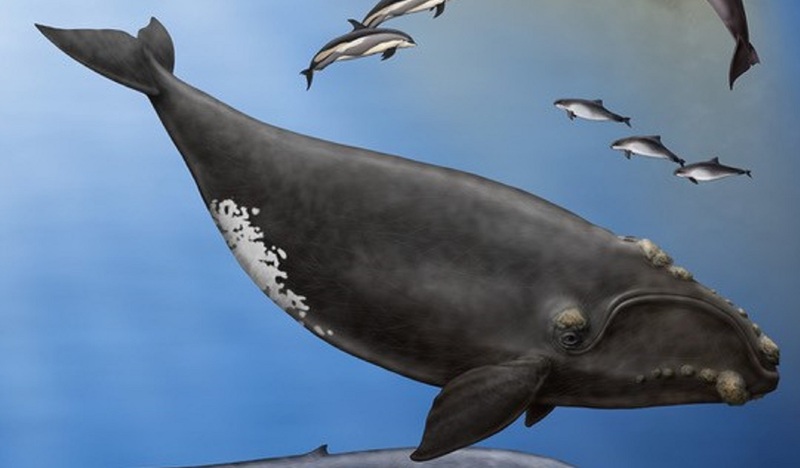 These features help mammals survive in this harsh environment. Also, since most species give birth in the spring, young must be raised quickly during the short summer. 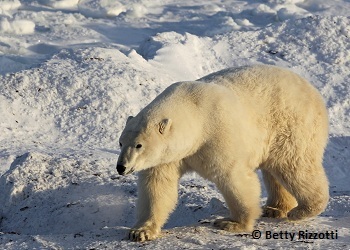 About 20 species of mammals live on the Arctic tundra. 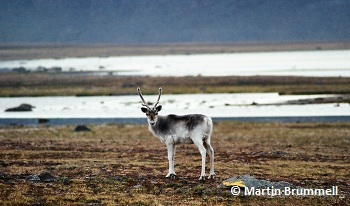 The Barren-ground and Peary Caribou are subspecies of caribou occurring from Alaska, to Baffin Island in Nunavut. Most populations, or herds, of this species migrate to and from the taiga, south of the tree line, and the tundra, but some smaller herds (the Dolphin and Union herd) remain in the tundra year round, migrating from wintering to summering areas over the sea ice. In the winter, caribou look for areas exposed by the wind with little snow or ice cover and/or softer snow, where they can scratch off the snow to find food (mainly lichens). In the summer, they feed on a variety of plants and shrubs. Different herds of this subspecies have some physical differences because of their habitats and habits. 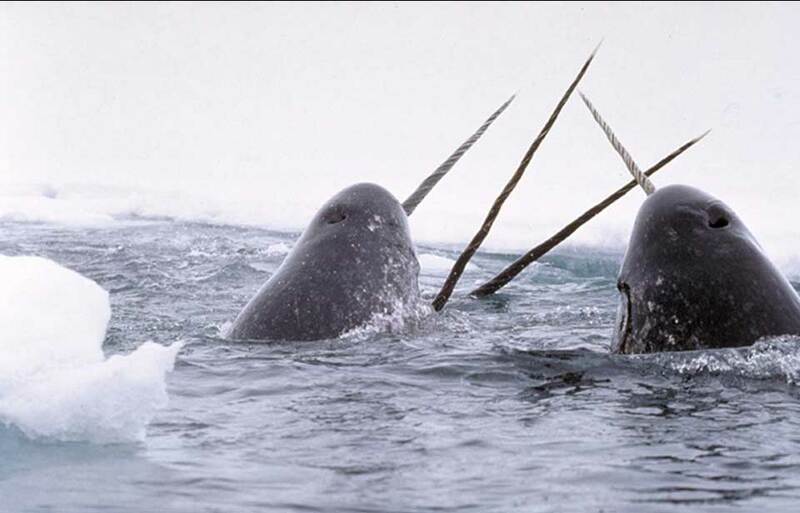 For example, individuals in the Dolphin and Union herd in the north are generally smaller than those that winter in the taiga. But all caribou are well adapted to their northern life and are equipped to conserve heat during the winter: they grow a thick winter coat and have a hairy muzzle, short ears and tail and a compact body. The Dolphin and Union herd is listed as being of Special Concern under the federal Species at Risk Act. 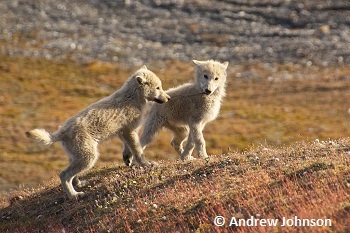 The Arctic Wolf is a smaller and lighter-coloured subspecies of grey wolf that lives on the tundra throughout the year. Its thick, commonly white fur may be useful camouflage during the winter, when wolves become less conspicuous to prey. Wolves can be found on the northern mainland and most of the Canadian Arctic islands, where they roam in packs or as individuals, often following caribou migrations. The Muskox, a relative of the bison and cow, lives only in the Arctic tundra. This species was a contemporary of the woolly mammoth, which survived to the end of the last ice age. Muskoxen survive the Arctic winters by digging craters with their broad hooves and horns in the snow and ice to get to and eat sedges and mosses. 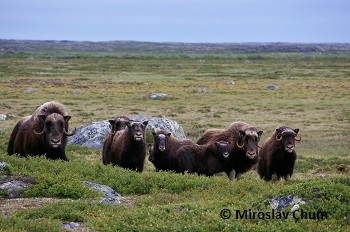 To keep necessary fat reserves, muskoxen must almost continually feed unless disturbed by storms. In the winter, they have two layers of fur, a woolly layer and a hairy layer, to help them stay warm. In the spring, muskoxen shed the woolly underlayer, which is called qiviut. Inuit use qiviut to make clothing and crafts. 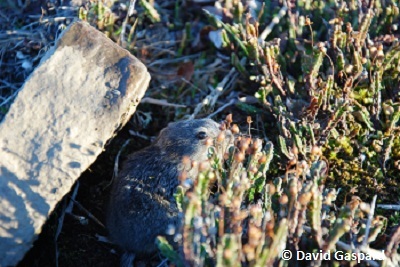 There are several species of lemmings and voles that inhabit the Canadian tundra. These mouse-like rodents remain active throughout the year, but spend most of the winter in burrows or foraging in the sheltered space between the snow and ground. They make a huge network of trails under the snow, and even make special places to use as the bathroom! While most pups are born during the summer, lemmings can also make their nests in the warm area between the snow and the ground in the early spring. When the snow melts, their old nests and the network of trails they used throughout the winter can be seen all over the tundra. 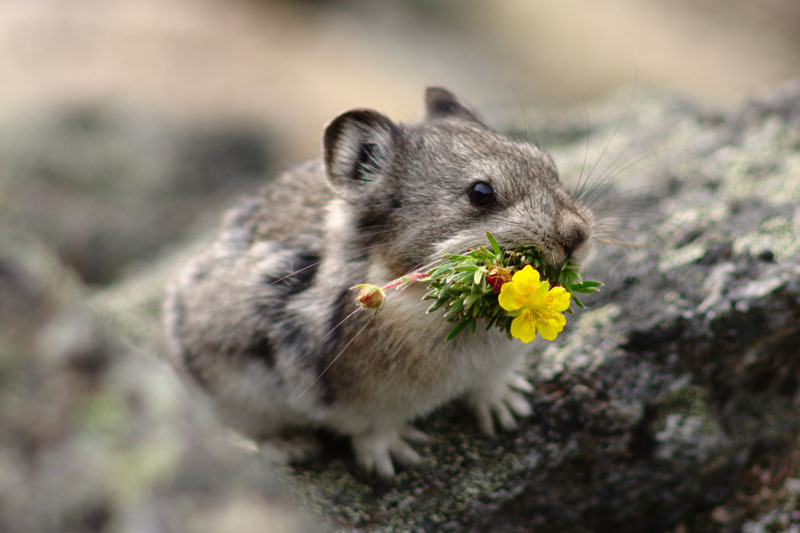 These are some the smallest tundra mammals but are considered a key species for the biome. Their population varies greatly in cycles of about four years, and as such the variations in their numbers have a great impact on their many predators, including the Arctic Fox and Snowy Owl. The Arctic Hare, with its short ears and thick fur, is well adapted to the tundra. This rabbit relative has black eyelashes that protect its eyes from the sun’s glare in the summer! It digs dens in the snow or soil where it rolls into a ball to conserve body heat. It uses camouflage to hide from predators, like the Arctic Wolf. During the summer, in the southern Arctic, they are a blueish-grey colour, allowing them to blend in better with the surrounding rocks. 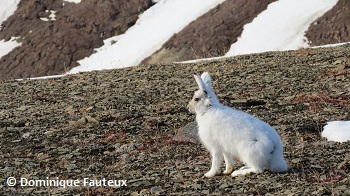 In the winter, and all year for those hares residing in the High Arctic, they turn white to stay unseen in the snow. Hares survive the winter by eating shrubs, mosses, and lichens found under the snow. In the summer, they eat buds, berries, leaves, roots and bark. Arctic Foxes are common in the Arctic tundra, thanks to their adaptations to the cold climate and their varied diet. Their thick furry tail is used not only for balance, but also as a warm cover during the cold months. Just like the Arctic Hare, the Arctic Fox’s fur changes colour from summer (brown or grey) to winter (white). 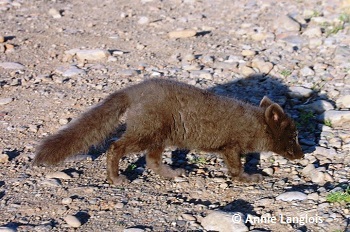 The population of Arctic Fox greatly varies due to fluctuations in lemming populations. 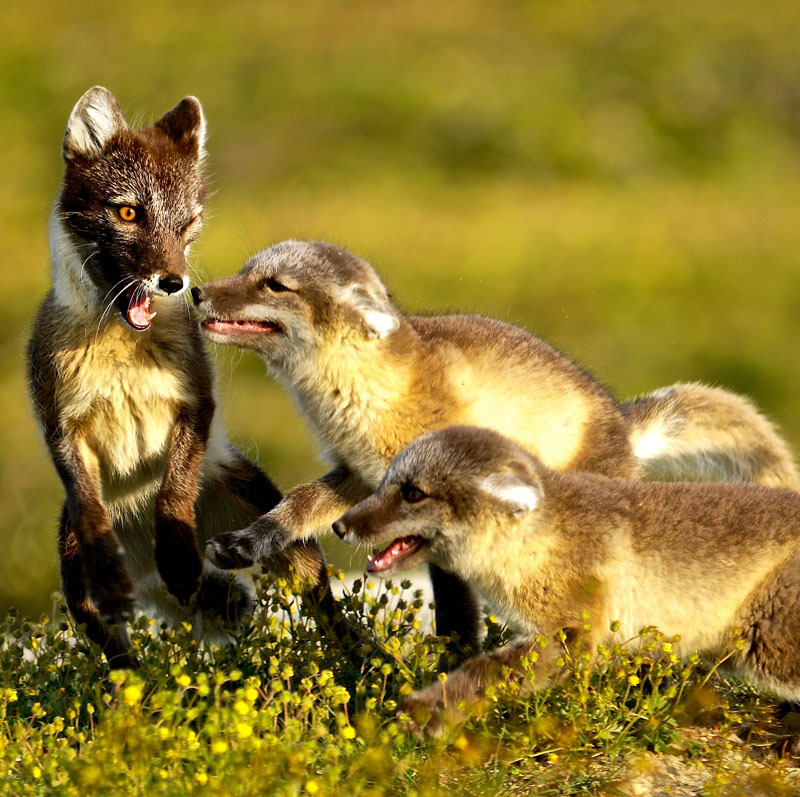 Arctic Foxes may also eat birds, fish, birds’ eggs and even plants. In lean years, this fox will travel great distances to search for food and will feed on carcasses left over from other predators, often following polar bears to scavenge. 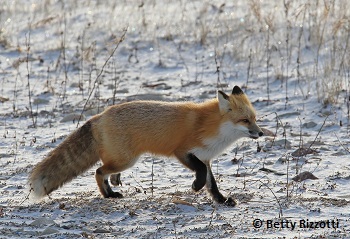 Other tundra mammals include the ermine, the Wolverine, the Muskrat, the Masked Shrew and the Red Fox. 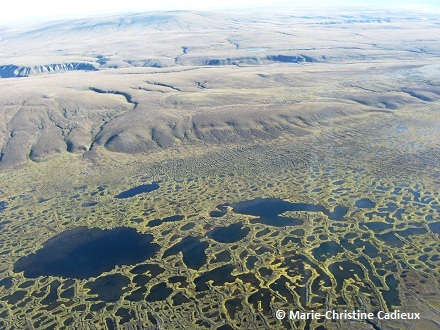 Because of the climate and permafrost, neither reptiles nor amphibians are found in the tundra biome. Many insects and other arthropods can be found in the tundra, such as the Arctic Bumblebee, the common fly, the black fly, the mosquito, moths, butterflies, beetles and spiders. Their life cycles differ, in terms of timing, from those of their southern counterparts, since these species deal with very short summers. Their larval stage tends to be much longer (as long as 7 years, for the Arctic Woolly Bear Moth), and their adulthood tends to be shorter. 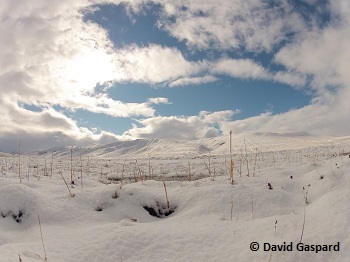 The larvae of tundra insects must be able to survive freezing in very low temperatures for prolonged periods of time. Bacteria, protists (a group of single-cell organisms, like bacteria, but that are more complex), worms and mites are also found in the Arctic tundra. These small animals are very important for the tundra biome. Shorebirds time the hatch of their eggs for the peak of insect emergence so that chicks have lots of food to eat! The special conditions that form the tundra make it a very delicate and sensitive biome. Its ecosystems’ structures are fragile, partly because of the low biodiversity and slow growth, and any change can cause long-term impacts. The Canadian tundra is home to species at risk like the Polar Bear, the Dolphin and Union populations of Barren-ground Caribou, the Peary Caribou, the tundrius subspecies of Peregrine Falcon, Eskimo Curlew, Red Knot and Prosild’s Bryum. 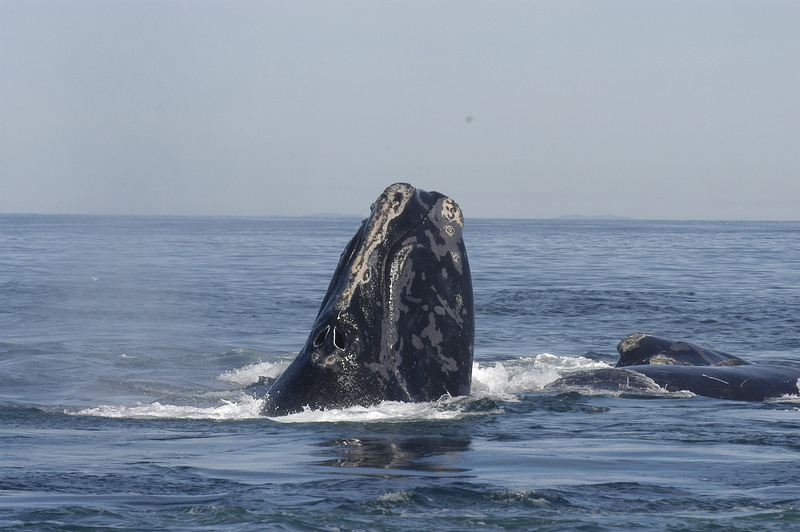 One of the main common threats to many of these species is climate change. Change in sea ice patterns could prove detrimental to some tundra inhabitants like the caribou, Polar Bear and Ivory Gull, since they rely on ice for migration and foraging. Many tundra species dig through the snow to get to food during the winter, and a possible increase in snow or ice thickness on land could bring famine to caribou populations. By contrast, thinner snow covers could be detrimental to other tundra species, since they rely on snow for protection during the winter. Increasing industrial operations, like mining and oil drilling, and other associated activities, like marine shipping, off-road vehicle use, road construction and blasting, may bring increased traffic, both on land and sea. For species at risk, these threats could include disturbances, loss and fragmentation of habitat, pollution and the introduction of species alien to the tundra. The tundra as a biome is sensitive to many threats. 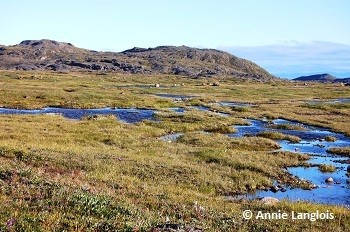 Climate change is probably the most important element threatening the tundra as a whole, since the landscape in itself, and the species inhabiting it, could change as a result of the melting of the permafrost and permanent ice, the drying of tundra ponds and changes in species’ timing of breeding and prey availability. The permafrost is not only melting because of higher temperatures, it is also affected by road and building construction. This melt could, in turn, release tonnes of carbon gases into the atmosphere, since a great quantity of organic matter is stored frozen in the tundra. The decay of this organic mass would increase greenhouse gas emissions, which feeds back into increasing the amount of melt. Because greenhouse cases contribute to ozone depletion, which increases ultraviolet ray intensity, especially at the poles, this would increase the rate of melting ice and speed up climate change. 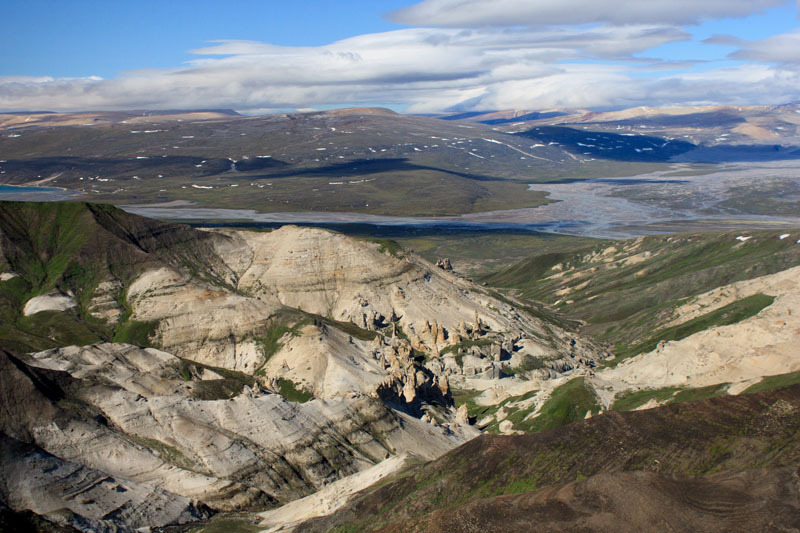 Other impacts of such changes in temperatures could be the increase of tundra fires due to the drying of the vegetation and the number of thunderstorms, and the arrival of typically southern species that would find new habitat in the warming Arctic. These species would likely push native tundra species farther and farther north through displacement, resource competition and the spread of disease, and reduce native biodiversity. Overall, the size of the tundra could shrink, leaving less habitat for native species. 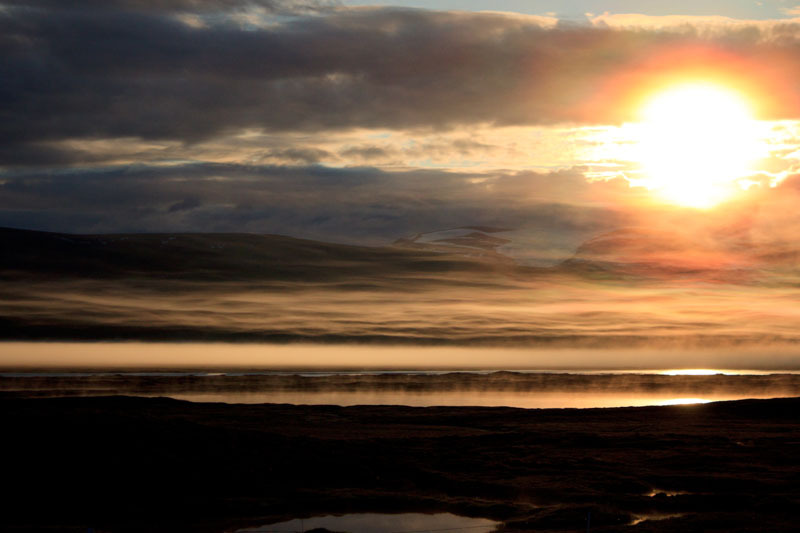 Air pollution is also a threat to the tundra. Air pollutants from the south are transported to the poles by the global air circulation patterns. While in transport, or upon deposition in the Arctic, these pollutants can undergo a chemical transformation. Some pollutants, such as persistent organic pollutants (POPs) and heavy metals, are resistant to breakdown and accumulate in the food chain. This accumulation can lead to health problems for fish, wildlife and humans. Also, many species of lichens, forming an important component of the tundra food chains, are sensitive to air pollutants and soil disturbance and can take decades to recover. The tundra’s species at risk are protected in Canada by the Species at Risk Act and by legislation in most provinces and territories. 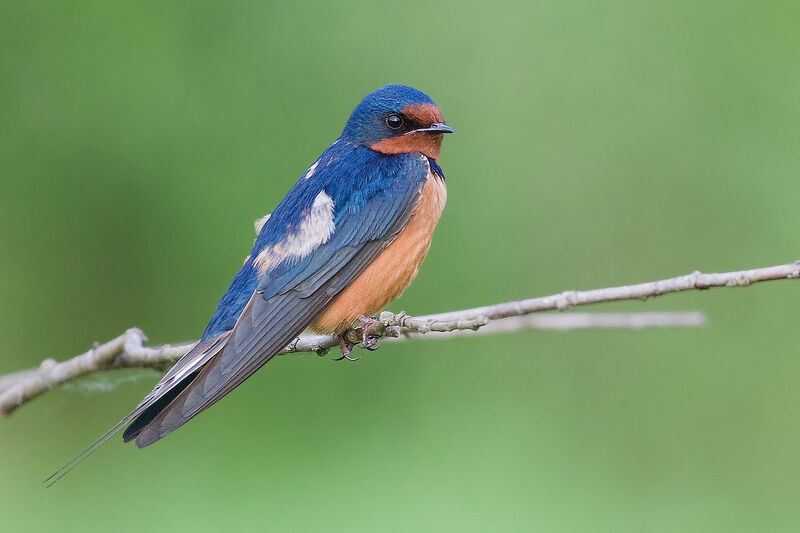 Also, migratory species, which make for a great proportion of bird species that inhabit the tundra during the summer, are protected by the Migratory Birds Convention Act. 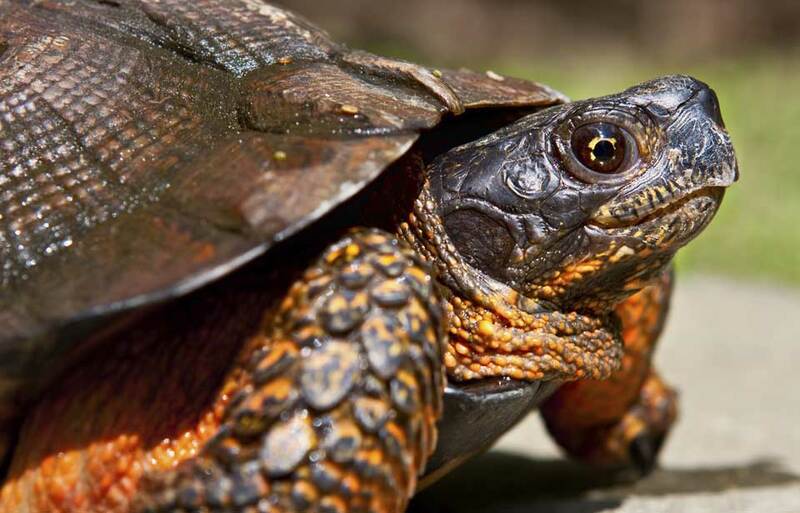 To help protect both species and their habitat, Environment Canada has developed a network of protected areas like National Wildlife Areas and Migratory Bird Sanctuaries. 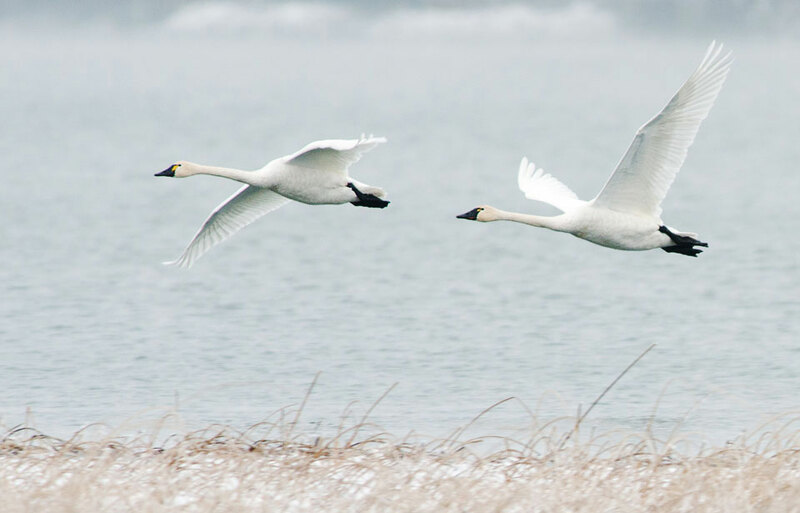 There are five National Wildlife Areas and 14 Migratory Bird Sanctuaries in the tundra biome. 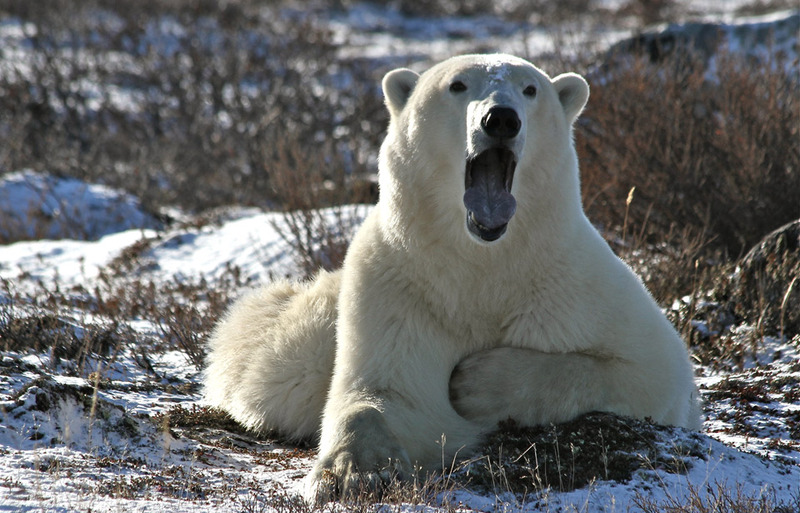 Several of these protect the habitat of species at risk, such as Polar Bear Pass National Wildlife Area on Bathurst Island, Nunavut, which is used by Polar Bear and Peary Caribou. 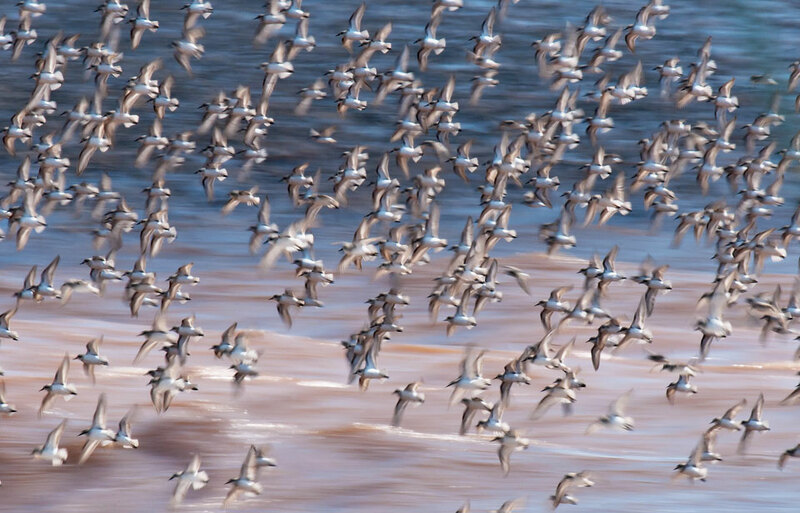 Each Migratory Bird Sanctuary holds a significant portion of the Canadian or global population of one or more bird species at some point in the year. 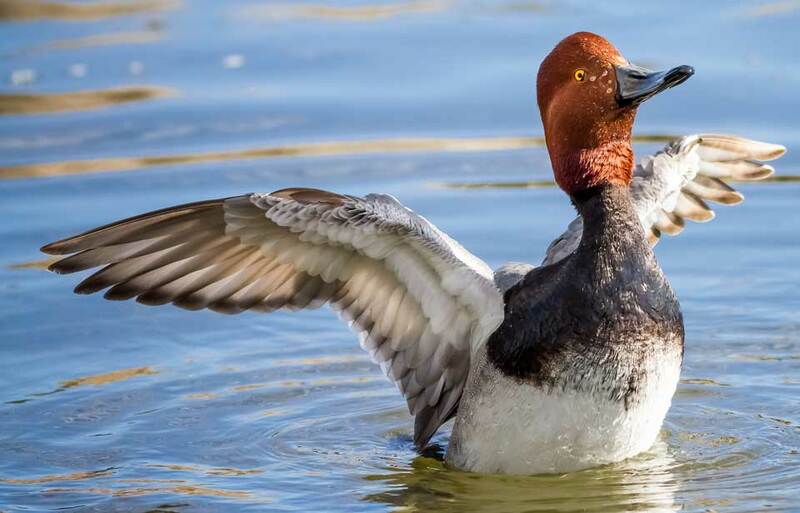 For example, the Queen Maud Gulf Migratory Bird Sanctuary alone hosts one million shorebirds and over four million geese each year, and that doesn’t even count all the other bird groups like loons, ducks, birds of prey and songbirds. Parks Canada also has a network of protected areas representing environments of Canada’s natural heritage. At present, eight national parks can be found within the tundra biome. In the provinces and territories where the tundra lies, areas have also been set aside for conservation by some provincial and territorial governments. 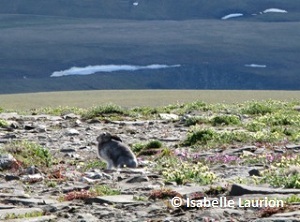 To ensure conservation of the tundra and its species’, research is underway to find out more about the biome. 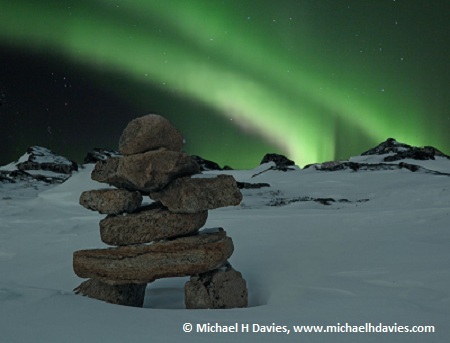 Environment Canada employs several of Canada’s top Arctic research scientists and supports millions of dollars a year in Arctic monitoring programs. 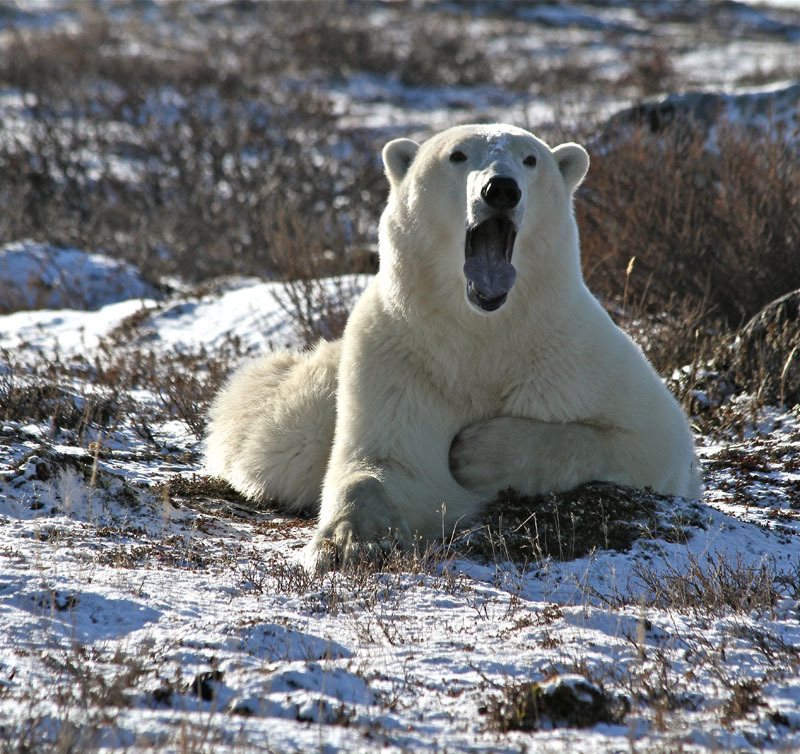 In addition, the Centre for Northern Studies at Université Laval in Québec City, the Churchill Northern Studies Centre in Churchill, Manitoba, the Aurora Research Institute in Inuvik, Northwest Territories, and the Nunavut Research Institute in Iqaluit, Nunavut, have many fascinating projects on tundra ecosystems and species. 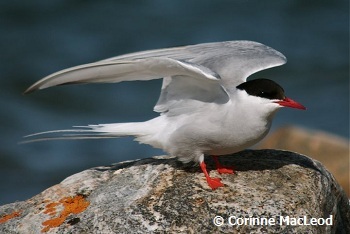 The Canadian Wildlife Federation also supports several research projects with its Species at Risk Fund, including projects on the Polar Bear, the Ivory Gull and the Red Knot. The projects aim to find out more about these species, their ecology and improvements in their conservation. 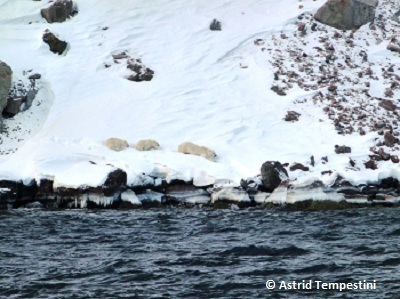 Created with the help of the Government of Canada during the last International Polar Year (2007-2008), ArcticNet brings together many of our Canadian researchers, who can then collaborate with research teams from other countries. It has continued beyond the International Polar Year, and its objective is to study the impacts of climate change and modernization in the coastal Canadian Arctic. 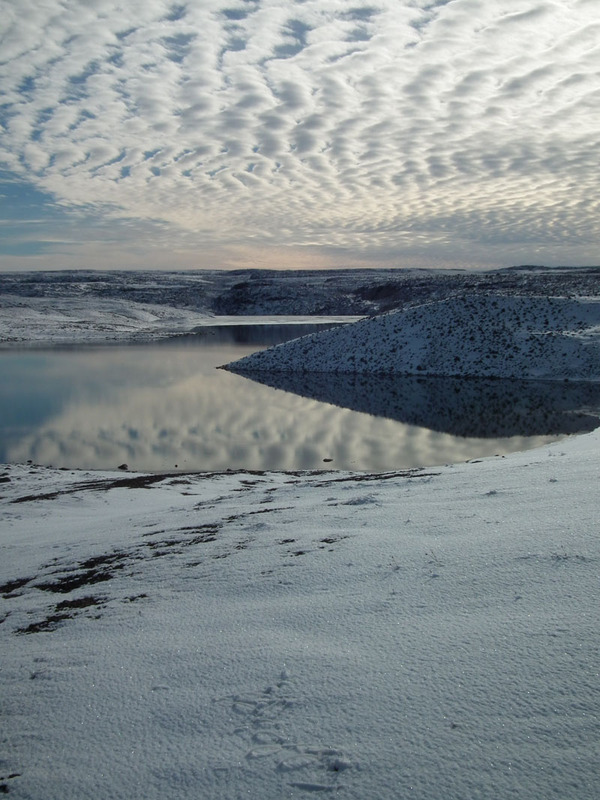 The Climate Change impacts on Canadian Arctic Tundra (CiCAT), also created through the International Polar Year, has scientists from all over Canada studying terrestrial ecology and the effects of climate change on the biome. There is also a plan for the construction of a federal Canadian High Arctic Research Station, which will provide a place where scientists can go study the tundra and expand the work that has been done for years at the Polar Continental Shelf Program facility in Resolute, Nunavut, which is run by Natural Resources Canada. With these projects, we will learn more about the tundra and how to use its resources sustainably. Educating the public and students is also very important to help conserve the tundra biome. Programs like the Canadian Wildlife Federation’s “Canada's North—Ours to Protect, the World's to Cherish” helps people understand the importance of our tundra and gives information about what can be done to help. CWF’s video series “Voices of the North” spotlights northern perspectives on the environment as well as traditional use of natural resources. Students can also learn more about strategies and adaptations of species living in the Arctic with the “Below Zero” activity guide. If you are visiting the tundra, tread lightly on the ecosystem. Take only pictures, and walk on sturdy ground as footprints can last for years and leave the tundra destroyed in that area. Also, keep in mind that some plant and lichen species, and the underlying ice-rich permafrost, are very sensitive to trampling by all-terrain vehicles. Even if you are hiking, walk on rock where possible. If you do not live in the Arctic, you can do much for the tundra. Since it’s sensitive to climate change, human activities and air pollution, some of your actions while in the South can have an impact in the North. Trees help clean the atmosphere of greenhouse gases! If you can, plant a tree in your yard, or organize a tree-planting activity in your community. Using less energy is a great way to curb climate change. Walk or cycle when possible, turn the heating or cooling system down a notch and use energy-efficient light bulbs and appliances! To inspire your friends, family and community about protecting the tundra and its inhabitants, learn more about this epic biome and the species found there. Then share your knowledge! © Her Majesty the Queen in Right of Canada, represented by the Minister of the Environment, 2012. All rights reserved.